Sounds are smooth medical instruments designed to enlarge the urethra. 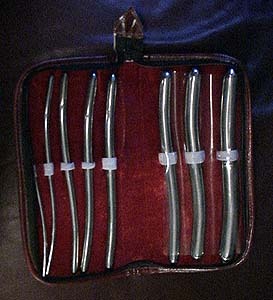 In a non-medical setting they are used both for urethral stretching, and (more commonly) for highly pleasurable stimulation. It's nothing like a urethral swab. Sounds need to be cleaned. They can pass disease from user to user if they are being shared. Even if they are not being shared, they can easily lead to bladder infections if not properly cleaned. Ideally, an autoclave should be used, but alternate cleaning includes 10% bleach solutions and pressure cookers. Dittel sounds have a flat end and a rounded end. Hegar sounds have two rounded ends, are fairly short, and are mildly curved in shape. Hegar sounds are typically the least expensive sounds on the market, and a number of companies online (including BMEshop) sell them in full sets of eight for as little as $40 - $60. These sets usually consist of slightly curved double-ended sounds starting at small sizes suitable for beginners, right up to absolutely monstrous thumb-sized sounds, for those more experienced people. These sounds are the most safe and comfortable for the female anatomy. Henk sounds have a more pronounced curve at the ends, as well as a metal rib on each end. 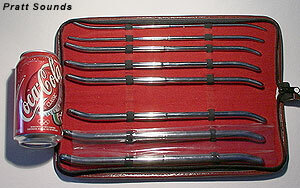 Pratt sounds are longer urethral dilators (double ended ones are usually almost a foot long) with rounded and slightly bent ends. Many men enjoy them for sounding. 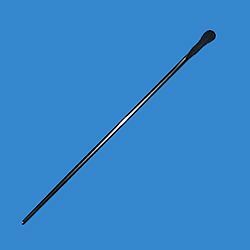 Van Buren sounds have a very pronounced curve at each end, specifically for the purpose of reaching the bladder. This page was last modified on 11 September 2006, at 14:14. This page has been accessed 306,353 times.